UNIVERSITY PARK — In Claysburg-Kimmel coach Mike Barbarini’s eyes, the Lady Bulldogs’ first-round PIAA Class 1A playoff softball victory Monday evening wasn’t a work of art. But it was a ticket to ride, and at this point in the season, that is the most important thing for every team. District 6 champion Claysburg-Kimmel punched its ticket to the PIAA quarterfinal round for the second consecutive year with an 11-1 mercy-rule win over Sullivan County at Penn State’s Nittany Lion Softball Park, Beard Field in a game that Claysburg ended by scoring four runs in the bottom of the fifth inning. Claysburg put together a 12-hit batting attack that featured a solo homer, double, and two RBIs from freshman third baseman Haileigh Reed, two hits — including a two-run double — from junior shortstop Emily Claar, and a pair of hits, including a two-run double, from freshman designated hitter Madison Frye. Happy about the win, Barbarini nonetheless zeroed in on the fact that Claysburg allowed Sullivan County to steal five bases. 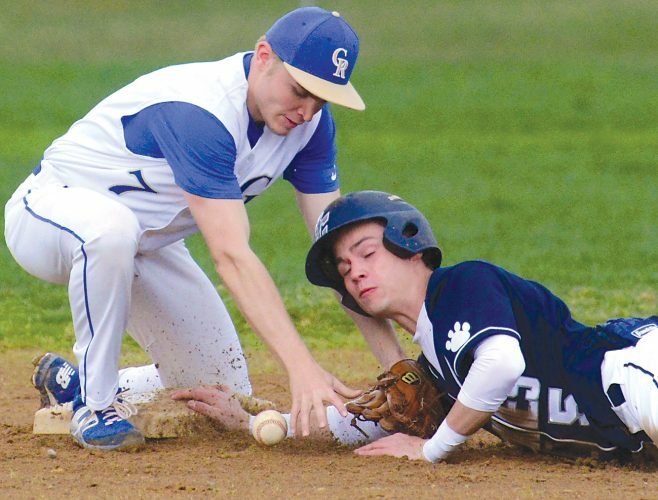 The fact that there will be another game for Claysburg — which improved to 19-4 and will face DuBois Central Catholic Thursday in the quarterfinals at a site and time to be determined — is of utmost importance. Claysburg capitalized on a Sullivan County mistake to take a 3-0 lead in the bottom of the second inning. After Frye singled and junior left fielder Corryne Weyandt reached on a fielder’s choice, junior right fielder Jazmin Kennedy lined a sharp two-out single to right field. Frye, Weyandt and Kennedy all wound up scoring when the ball was misplayed in the outfield, staking Claysburg to an early lead. Freshman right-handed pitcher Olivia Bushore fought through a sore ankle to toss five innings for the victory, allowing just one run on five hits. Sullivan County had runners on second and third with one out and a run already home in the third inning, but Bushore struck out Madison Burke looking and junior center fielder MyKenzie Malacusky swinging to keep the runners stranded. Sullivan County also loaded the bases with two outs in the fourth inning, but Bushore got freshman third baseman Jaeden Patson to line out to Weyandt to keep Sullivan County off the scoreboard. Claysburg opened up a 7-1 lead with four runs in the fourth inning. Reed’s solo homer over the fence in left-center field, Claar’s two-run double to right-center, and senior second baseman Raelynne Grabill’s run-scoring single to left were the big hits. Claysburg enacted the mercy rule in the bottom of the fifth inning, when Reed knocked in one run with a sacrifice fly, Frye hit a two-run double to left-center, and Grabill drew a bases-loaded walk to force in courtesy runner Megan Hartman with the clinching run. And now it’s on to the quarterfinal round, where Claysburg’s season ended a year ago. Everybody is hoping for a better result this year. Barbarini is hoping that Claysburg can negotiate Thursday’s quarterfinal hurdle as well. SULLIVAN COUNTY (1): Houseknecht c 211, Patson 3b 301, Fry ss 301, M. Burke p 300, Malacusky cf 301, Randall lf 101, King 1b 100, K. Burke rf 200, Baldwin 2b 100. Totals — 20-1-5. CLAYSBURG-KIMMEL (11): Claar ss 212, Grabill 2b 201, Knisley 1b 300, Musselman cr 010, Mikalynn Bauman cf 311, Cavender c 200, Mikenlee Bauman c 111, Reed 3b 212, Bushore p 000, Frye dh 222, Hartman cr 010, Weyandt lf 322, Kennedy rf 311. Totals — 23-11-12. E–Reed, Fry, K. Burke. 2B–Claar, Frye. HR–Reed. RBI–Fry, Claar 2, Grabill 2, Reed 2, Frye 2, Kennedy. LOB–Sullivan County 7, Claysburg-Kimmel 4. SAC–Grabill. SF–Reed. SB–Randall 2, Houseknecht, Malacusky, Patson. CS–Claar (Houseknecht to Fry). Sullivan County: M. Burke (L) 4.2 IP, 12H, 11R, 7ER, 4BB, 0SO. Claysburg-Kimmel; Bushore (W) 5IP, 5H, 1R, 1ER, 4BB, 7SO. Records: Sullivan County (16-5); Claysburg-Kimmel (19-4). Umpires: Dan Olsavsky (plate); Bruce Legros (first base); Tony Olsavsky (second base); Bill Zamboni (third base).